Adam Hyland, Gabriele Schafer, and Ross Pivec in Filler. Photo by Max Ruby. BOTTOM LINE: This new play about the complexities of human relationships is an interesting character study, even if it’s not an entirely compelling drama. 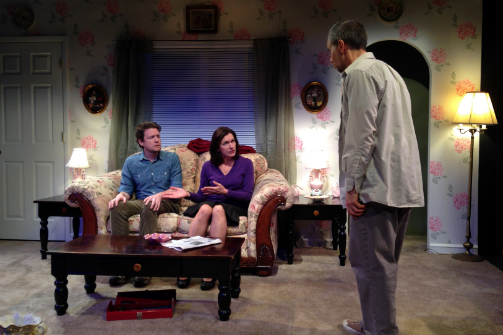 In the opening scene of William Goulet’s new play Filler, an apathetic Adler (Ross Pivec) reacts to the aggressive advances of his wife, Marian (Gabriele Schafer), by lamenting: “All of a sudden you want us to change. I thought we got on as we were.” It’s an innocent exchange, but its immediate characterization of this central relationship as disjointed and dysfunctional lays the groundwork for some of Filler’s most provocative queries: what are we to do when we find ourselves wanting more -- and where are we to turn when those to whom we’re closest have nothing more to give? Written and directed by Goulet, Filler is the story of Marian and Adler, a married couple whose twelve-year union is defined (if not plagued) by apathy -- towards intimacy, towards their community, and, perhaps most disturbingly, towards any sort of genuine human connection. Their complacency is threatened, however, when a pair of repairmen (Kyle Minshew and Adam Hyland) arrives in their neighborhood, and begins dismantling the couple’s emotional walls and defenses as easily as they dismember the pillars that support the duo’s home. As alliances amongst the foursome are forged and broken, Goulet leaves behind a stark portrait of contemporary humanity at its most raw. Goulet’s exploration of the complexities of dual relationships, however, is somewhat mangled by his writing’s tonal vacillation between the natural and the absurd, but his skills as a director are evident throughout, particularly in the performances he has drawn from a solid ensemble of five. Most notably, Pivec and Schafer exhibit a genial chemistry as Adler and Marian that makes them instantly believable as a duo with a decade-long history, and Pivec is especially successful at presenting the man-child Adler as innocent without seeming immature. Goulet’s production is also aided by some beautiful design; in fact, this play is most noteworthy for its aesthetic. Scenic designers Christopher and Justin Swader have done remarkable work transforming this black box into Adler and Marian’s living room, populated with some appropriately antique furniture pieces, and Mary Ellen Stebbins’s lighting design expertly follows the emotional trajectory of the piece. Despite some impressive performances and an engaging design, however, Filler, as a whole, isn’t quite equal to the sum of its parts. Goulet’s writing begs some interesting questions to be sure but, as it is now, it requires a bit too much effort on the part of the audience to ever truly reach them.